Clear some space out, so we can space out. Shabazz Palaces are an experimental hip hop group from Seattle, Washington that was formed by Ishmael "Butterfly" Butler (ex Digable Planets) and Tendai Maraire. Avoiding the typical 16 bar hip hop formula, while embracing elements from dubstep and electronic minimalism, Shabazz Palaces have been making waves in the independent music scene since their project birth in 2009. In 2010, Shabazz Palaces were signed to indie giant Sub Pop records, making them the first ever hip hop group to be signed by the Washington based label. While attempting to remain enigmatically incognito, Shabazz Palaces released the EPs Shabazz Palaces and Of Night in 2009 on Switchblade Music. Due to the group’s tremendous amount of hype and critical acclaim (not to mention Butler’s status as a living legend of hip hop) the group was no longer able to stay incognito. Shabazz Palaces’ latest LP Black Up was released by Sub Pop in 2011. 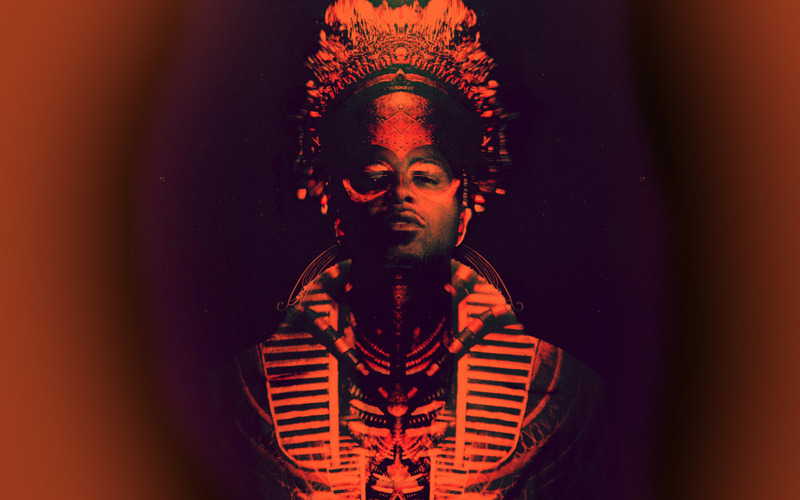 Shabazz Palaces is a project centered around Seattle-based rapper Ishmael "Butterfly" Butler. A former member of 90s hip-hop jazz pioneers Digable Planet, Butler tried to remain anonymous as Shabazz Palaces released a couple critically acclaimed EPs in 2009, not granting interviews or printing his name on the releases. But it's impossible to remain anonymous for long when you're as hotly buzzed as Shabazz Palaces, not to mention the first rap group ever signed to the highly influential indie label Sub Pop. The veteran label seems to have chosen well. Shabazz Palaces exploded onto the national and international music scene's consciousness with their highly original 2011 debut full-length, Black Up. Released in June, Black Up is a stunning minimalist take on hip hop; ten tracks of ominous, electronic production that gets buttered up by Butler's smooth flow. Its sparse metallic beats and slinky echoes have as much in common with post-dub step musicians like James Blake as most chart topping MCs of the moment. “A treatease Dedicated to the Avian Airess from North east Nubis (1000 Questions, 1 Answer)” is long on title, but not instrumentation. A growling low-end synth moves in rhythm with the skittering beat while creepy keyboards warble in the background, creating a murky vibe. Butler's rhymes move in a steady rhythm, clean and clicking in over the jumpy beat. Shabazz Palaces pulls out the incense and shag carpets for “Recollections of the Wraith,” a soulful guitar sample glows in back with a pretty female vocal loop as Butler commands you to “clear some space out, so we can space out.” “Swerve … the reeping of all that is worthwhile (Noir now withstanding)” is Butler's five minute argument against fakes and wannabes “If you talk about it, it's a show, but if you move about it, then it's a go.” The track's got a crunchy start-stop drum beat that could be in a Black Keys song alongside a see-sawing synth. Butler's clipped flow is some of the best on the album as he juggles a tangle of syllables, “Golden-tempered circles enjoyed only by the members. Heat sparks, raining vodkas upon the spinners. Moving and proving smooth sh*t, you grooving, you a winner.” Shabazz Palaces is not your typical rap crew, and Black Up is a compelling effort, exploring unique corners of hip hop.